Wagner-Meinert provides a full line of industrial and commercial refrigeration products for food processors and cold storage warehouses throughout the Midwest. We work closely with customers to determine the proper equipment requirements for their unique applications as well as install and service the equipment. We can install and service all major manufacturers ammonia compressors, condensers, and evaporators to solve your refrigeration needs. 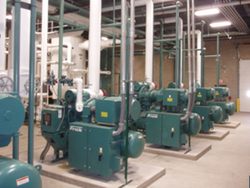 Compressors are the heart of any ammonia refrigeration system. Compressor failures or undersized compressors can waste valuable production time. We can help trouble shoot lost refrigeration capacity and improve energy consumption. For certain applications, a two-stage compressor configuration can provide better refrigeration performance while actually reducing energy costs. Condensing capability is extremely important to providing the most cost efficient refrigeration. If a systems condensing capacity is too low, energy usage by compressors to maintain required refrigeration will be abnormally high and compressor failures will be more frequent. Vessel Packages Wagner-Meinert’s team of engineers can provide advice on the proper design, installation and operation of many different vessel packages. High Pressure Receivers, Accumulators, Surge Drums, Liquid Recirculator Packages, Thermosyphon and Intercooler vessel packages have specific functions within a refrigeration system. Depending on an existing system’s design, one vessel package or a combination of packages can greatly improve the overall refrigeration and energy efficiency of the system. Most packages can be designed with a vertical or horizontal vessel to accommodate floor and height space limitations. 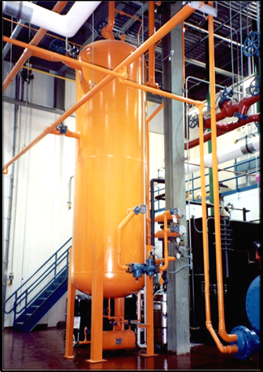 All vessel packages use vessels manufactured to comply with ASME boiler and pressure vessel code. Proper sizing of a vessel package for current and future refrigeration needs is essential to gain refrigeration and energy efficiencies. Sometimes replacing two small vessel packages with a larger vessel package can produce significant results. Wagner-Meinert is one of the Midwest leading Design/Build Refrigeration Contractors specializing in Industrial Ammonia Refrigeration Systems. 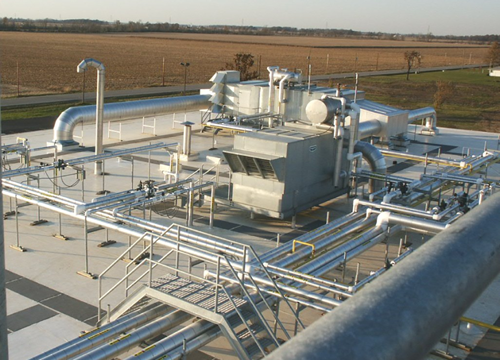 Wagner-Meinert has designed, installed and serviced freon and ammonia refrigeration systems for Food Process industries, Cold Storage Distribution facilities, Pharmaceutical and the Fertilizer industries since 1991. Our Design/Build Team of engineers takes pride in developing your project from concept to completion on time and within budget. A Recirculator Package can separate ammonia vapor and liquid very effectively while trapping oil flowing through the system. This type of package can be very useful in keeping the evaporator coils supplied with liquid ammonia to increase refrigeration. 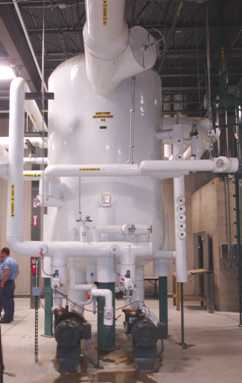 In today’s very competitive High Tech Industry, Wagner-Meinert’s Team of highly qualified Engineers, Project Managers & Service Technician has the experience needed to design your Industrial Ammonia Refrigeration Systems. Our customized designed industrial refrigeration systems will meet or exceed your needs while staying within capital spending budgets.